The PowerCLI script takes Function Set-ESXiDPC from https://github.com/lamw/vghetto-scripts/blob/master/powershell/ESXiDisableProtocolConfiguration.ps1 (via Cluster) but makes sure the single ESXi host in is maintenance mode. The script was tested on ESXi 6.0 + 6.5 with a 6.5 VCSA that is TLS 1.2 only. Pulled Nov 29, 2017 https://github.com/lamw/vghetto-scripts/blob/master/powershell/ESXiDisableProtocolConfiguration.ps1 The PowerCLI script takes Function Set-ESXiDPC (via Cluster) but makes sure the single ESXi host in is maintenance mode. The script was tested on ESXi 6.0 + 6.5 with a 6.5 VCSA that is TLS 1.2 only. # What is the vCenter and ESXI FQDN? 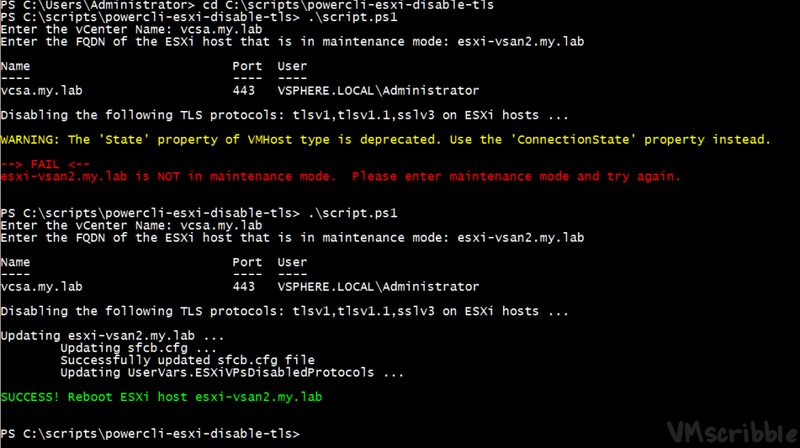 $esxihostname = Read-Host "Enter the FQDN of the ESXi host that is in maintenance mode"
$sfcbResults+="enableTLSv1: " + (!$TLS1).ToString().ToLower() + "`n"
$sfcbResults+="enableTLSv1_1: " + (!$TLS1_1).ToString().ToLower() + "`n"
$sfcbResults+="enableTLSv1_2: " + (!$TLS1_2).ToString().ToLower() +"`n"
$result = Invoke-WebRequest -Uri $url -WebSession $websession -Body $sfcbResults -Method Put -ContentType "plain/text"
Write-Host "`tSuccessfully updated sfcb.cfg file"
Write-Host "Failed to upload sfcb.cfg file"
Write-Host -ForegroundColor Red "Error: You must at least enable one of the TLS protocols"
$tlsString = $tlsString -join ","
Write-Host "`nDisabling the following TLS protocols: $tlsString on ESXi host ...`n"
Write-Host "SUCCESS! 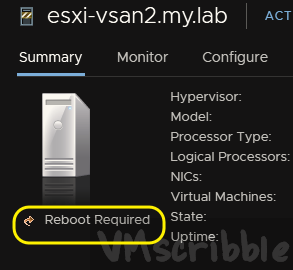 Reboot ESXi host $esxihostname " -ForegroundColor "Green"
Write-Host "--> FAIL <--" -ForegroundColor "Red"
Write-Host ($vmhost.Name + " " + "is NOT in maintenance mode. Please enter maintenance mode and try again.") -ForegroundColor "Red"